Get out and have some fun for Spring Break! Here are some great deals and discounts for fun around Nashville. Keep coming back – we will add more as we find deals. Please comment if you know something we should add too! Country Music Hall of Fame – Visit March 8 – April 7, 2019 and youth from Davidson and bordering counties may enter the museum free, as part of the museum initiative, Community Counts. Up to two accompanying adults receive 25 percent off admission. Proof of residency is required. Check out all the special spring break fun HERE. Stardust Drive In – Now open for the 2019 season. $8.50/adult and $6.50/kids (6 to 11), 5 and Under FREE for a double feature. Nashville Tourism Discounts – Grab a discount from visitmusiccity.com and become a hometown tourist. Grab tickets for BrickUniverse coming to the Wilson County Expo Center March 30th and 31st. Click here to save 50%. Keep checking back – More great discounts coming soon!!! 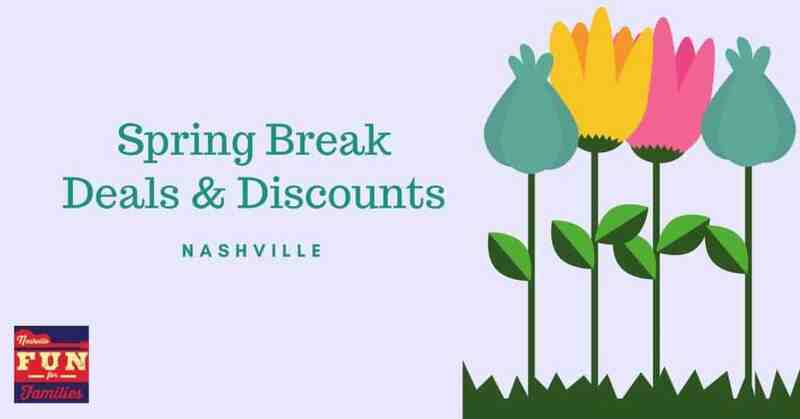 Looking for more fun to stay busy over Spring Break in Nashville? Check out our Spring and Easter guide that is full of ideas. Don’t forget to check out the calendar for fun events too!